Adventure travel achieves new lengths and depths in Greater Fort Lauderdale. Whether by bike, foot, kayak, surf board or Scuba tank, adventurers will find much to explore and do in South Florida. Be sure to bring your camera - except when waterskiing, of course. Many outfitters offer free lessons and equipment rentals. Dive right in - the water&apos;s better than fine. Just off Greater Fort Lauderdale&apos;s 23 miles of clean, Blue Wave-certified sands is a three-tiered living coral reef system and more than 75 artificial reefs that have made this one of Florida&apos;s most popular dive destinations. Snorkelers can swim a few hundred feet off shore (remember your buddy and dive flag) to reefs that begin at less 15 feet in depth in places like Lauderdale-By-The-Sea, just south of Anglin&apos;s Pier at Commercial Boulevard; Greene Street, three blocks north of Hollywood&apos;s North Beach Park; or Dr. Von D. Mizell-Eula Johnson State Park in Dania Beach (click here to learn about more Greater Fort Lauderdale dive sites). MEDIA VIPs: The Greater Fort Lauderdale Convention & Visitors Bureau offering "Train and Try" opportunities for VIP media. Get certified where you live, then experience Greater Fort Lauderdale&apos;s unsurpassed Scuba scene. For a preview, visit http://www.sunny.org/ways-to-play/sports/scuba/ to watch a special destination dive video. Those who say Florida&apos;s flat terrain has nothing inviting, tell that to kayakers paddling among the mangrove estuaries of Anne Kolb Nature Center or at sunrise / sunset along the Atlantic coast. Take to the water&apos;s surface - hopefully - in a whole new way. Beginners and experts can enjoy waterskiing the Intracoastal and areas waterways. Learn at McGinnis Waterski. Kneeboarders, slalom skiers, trick-skiers - even surfers - can go ocean-less at Ski Rixen USA. This cable water-skiing facility requires no boat - only a cable pulling participants 12 years and older around a freshwater lake at Quiet Waters Park. It&apos;s the only wakeboard and water-ski park in South Florida. Amateurs and professionals welcome; the facility occasionally hosts competitions. Sure, we have no mountains. But mountain biking enthusiasts will be challenged by Greater Fort Lauderdale&apos;s challenging bike trails. Visit Markham Park in western Broward County for more than 10 miles of wooded trails. To the north is Quiet Waters Park, whose 7.1 miles of trails have been fully renovated under the supervision of the International Mountain Biking Association. 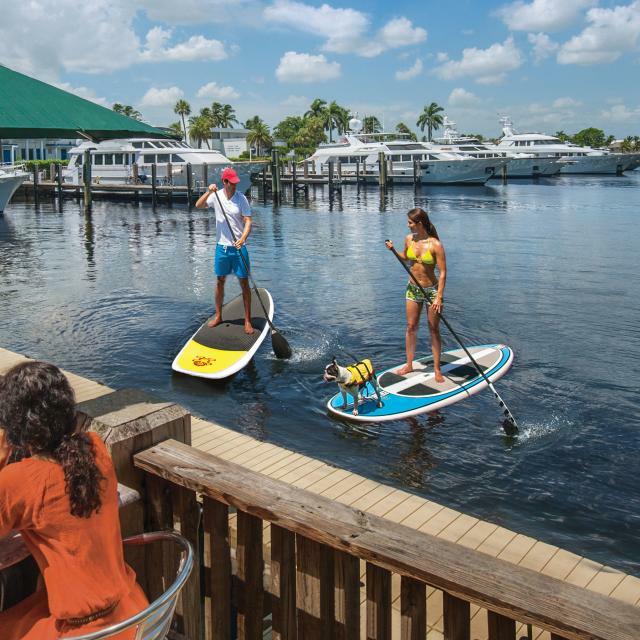 Half-day or day-long trips can include excursions to Sawgrass Recreation Park or for a change of pace, try yoga from atop a paddle board.